When you wince while seeing someone experience pain—a phenomenon called "neural resonance"—mirror neurons are responsible. Participants also responded to scenarios in which causing harm would make the world worse—inflicting harm on another person in order to avoid two weeks of hard labor, for example—to gauge their willingness to cause harm for moral reasons and for less-noble motives. But the researchers found no correlation between people's brain activity and their willingness to hypothetically harm one person in the interest of the greater good—such as silencing the baby to save more lives. Those decisions are thought to stem from more cognitive, deliberative processes. Questions like this are moral false dilemmas, because the question is always set up in a way to force one to act unethically, and if you should find a loophole - like sticking your finger in the baby's mouth for a pacifier - they always find some excuse why you couldn't solve it that way. So in essence, the people put under the question are not making free decisions - the researchers are deciding for them. By suppressing free thought, the researchers are distorting the decisionmaking process by forcing the subject to think unethically, when in reality they might be trying to solve the problem in an ethical way. Once primed such, no true behaviour can result. This problem is illustrated by the short fictional story about Mr. Feynman and the Lightbulb: "What would Feynman do?" In other words, when one is primed to think unethically, "I must kill one of them", then the question becomes about how to choose, and that question also involves evaluating the social effects of the choice, i.e. "which choice reflects the best on me". People with stronger social affinity are more likely to go for the socially acceptable choice, like "save the baby" as an intuition. Empathy involves reasoning about other minds and externalizing your own self, so the observation doesn't actually tell whether the people are feeling empathy for the baby, or empathy for themselves in avoiding social shame. To test that, you'd have to isolate the social aspect by ensuring that nobody will know whether one chose to kill the baby. I don't understand you, that would defeat the purpose of the study. It's not meant to be a study in creative problem solving, they explicitly want to force you to choose the least bad (in your opinion) of only two rotten choices. How else can you study morals? Only ask pleasant questions? Would you kill an innocent person to save two other innocents or 5, 10, 100, 1000? Different people will give different answers that's how you study these things. 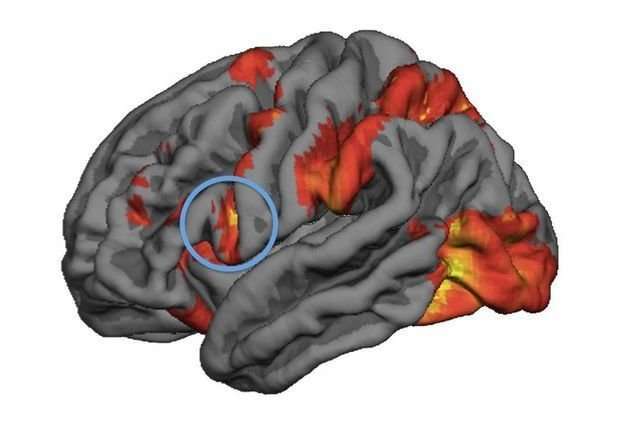 "Researchers found that the brain's inferior frontal cortex (circled) is more active in people who are more averse to harming others... The study confirms that genuine concern for others' pain plays a causal role in moral dilemma judgments"
-Perhaps they've found the location of the psychopath defect. Next will be to examine psychopath brains for evidence. Most people are trying to be good, and suppressing that reaction by force has the effect of fudging up the result. It no longer represents the person's morality, but their behaviour in an entirely artifical situation where they are being primed to act against their moral instincts. In such situations, people's moral compass tends to go hang. Unfortunately it's no longer ethically permissible to do tests like the Milgram experiment, or the electric shock test. "In his experiments , the volunteers (all were female, as were the experimenters, to avoid gender effects) were given £20 (US$29). In pairs, they sat facing each other across a table, with a keyboard between them. A participant designated the 'agent' could press one of two keys; one did nothing. But for some pairs, the other key would transfer 5p to the agent from the other participant, designated the 'victim'; for others, the key would also deliver a painful but bearable electric shock to the victim's arm." Not really. In the Milgram experiment, the test subjects were intentionally made to believe they were seriously harming another person, and told to continue. They were subjected to a genuinely traumatic experience. The Stanford experiment in turn quicky spiraled down to cruelty and physical violence, with one "inmate" suffering a mental breakdown. Then there were other questionable studies, like the one where they gathered a church full of priests and gave them all LSD without them knowing they'd been drugged - to see what would happen. - And black soldiers were infected with syphilis. So what? What do any other immoral experiments have to do with this one? Just a suggestion... you really ought to post refs and excerpts rather than ad libbing. This article is another step up the technological ladder that could have grave consequences for our society. The devices to read human thought, are veing researched and developed. Which leads to several issues we, as a society, will need to address within this century. Compulsory or voluntary? With all the privately owned firearms available... How do you convince the guntotters that they should obediently allow themselves to be tested? And what if they decide not to abide by the 'scientific' testing results? How will we confirm that the results are correct? And not a manipulation by some special-interest group? When it goes wrong, and an innocent party comes to harm? Whether by failing to detect a criminal psychopath or by persecuting a sane person with accusations of being a threat to society? How will you determine the error and make amends? The point is, after the Standford experiment, ethical standards were raised to exclude such studies. It is no longer permissible to perform them. It is not possible, or permissible, anymore to design a test where a person is genuinely convinced that they're in command of another person's life or death - so it is not possible to commit an experiment that would reveal how they really would react to such a moral dilemma. So these test devolve down to social expectations. The mirror neurons activate when people think of what other people would think of them, like trying to reason what choice would reflect the best on their person on a social point of view, rather than feeling empathy for the potential victims.